"There is nothing that does not come from Hu. Of everything Hu is the inmost Self. Hu is the Truth; Hu is the Self Supreme. You are that, Shvetaketu; you are that." "Please, Father, tell me more about this Self." "Yes, dear one, I will," Uddalaka said. "Strike at the root of a tree; it would bleed; but still live. Strike again at the top; It would bleed but still live. If the Self leaves one branch, that branch withers. If it leaves a second, that too withers. If it leaves a third, that again withers. Let it leave the whole tree, the whole tree dies. and the Self departs from the body, the body dies. But the Self dies not." 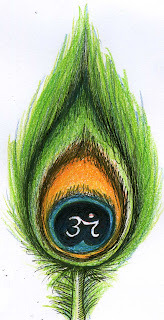 You are that Shvetaketu; you are that." "Please Father, tell me more about this Self." "Bring me a fruit from the nyagrodha tree." "Break it. What do you see?" From that a whole nyagrodha tree will grow. There is nothing that does not come from Hu. Hu is the Truth; He is the Self Supreme. "Yes dear one, I will," Uddalaka said. "Place this salt in water and bring it here tomorrow morning." "Where is that salt?" his father asked. "I do not see it." "Sip here. How does it taste?" "I taste salt everyplace I sip from." "It is everywhere, though we see it not. Within all things although we see Hu not. And shouts, 'I am left here and cannot see!" Attains to spiritual wisdom in the Self. Here the Divine Pronoun "Hu" is used instead of 'He', for the Divine Essence is beyond any qualification of gender.